As any marketer or retailer will tell you, differentiating your offering from your competitors is a critical success factor - and increasingly so in a world dominated by a few big retailers and big outdoors brands. In the online world, differentiation becomes even more important, but harder to achieve, if you want to avoid succumbing to discounts as your major sales lever. To take a view on how differentiated the online offerings are, we could take a look the leading websites and we’d no doubt get a valid, if rather subjective, sense of key brands, presentation, key product categories, etc. But that’s when we’ve already got to the website (and we’re probably browsing around, rather than seeking out product - a different intent to the average shopper). What about the route that people use to get to these properties? In a search-centric online world, it’s crucial that we consider how the search engines (OK… Google!) understand the positioning and presentation of outdoors retailing websites. Otherwise, you might think you have a strong category presence in trail-running but, if you’re not getting page 1 rankings across a broad set of trail-running related search terms, you’re not a category leader to the online shopper - because they haven’t seen you. Understanding how Google perceives a website’s priorities and competitive value is clearly of benefit to that individual retailer. However, it’s highly-relevant when we consider our competition, even though most online retail teams tend to focus only on how competitors affect their own basket of key search terms - whereas it should be the equivalent of a good old-fashioned store check, where we want to know what’s driving a competitors footfall and what their proposition is, not just how well they compete with us on Scarpa boots. One tool I use to get a quick fix on a competitive landcape is wordclouds. Yes, those rather outdated visuals used relentlessly in school projects. The truth is that, before diving into the data swamp that most most ecommerce specialists contend with, it’s really helpful to understand the overall context and to make our subsequent work a bit more focused. For example, here’s a cloud for Ellis Brigham, using Resonant’s DCrux estimates. This is a close approximation of reality based on the top 200 organic search terms that have driven traffic to their website over the past month (so they have some seasonality). It just happens that these terms account for c.50% of Ellis Brigham’s organic traffic (EB don’t use paid search very much). 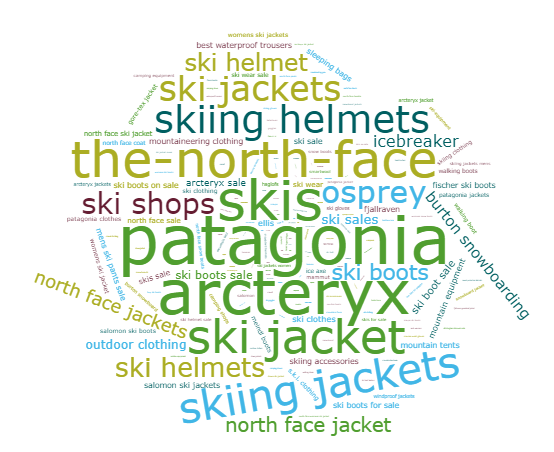 It’s very easy to see from this that certain product terms are very dominant, such as ski and jacket related terms, whilst certain brands also stand out, including Patagonia, North Face and Arcteryx. As a start, this gives us a good idea of how Google perceives the website and what terms are bringing a high proportion of Ellis Brigham’s traffic, because Google ranks this site highly for those terms. So, does this focus allow Ellis Brigham to flank their competition at all? Let’s take a look at Cotswold Outdoor, who tend to enjoy a fairly dominant search engine position in outdoor gear. Again, it’s the 200 search terms that bring most traffic to their website. Probably the first thing to note is how Cotswold’s organic traffic is more broadly-based than Ellis Brigham’s, as you might expect of a more generalist retailer. Visually, there are fewer really dominant terms in the word cloud and far more more ‘mid-sized’ search terms. The product category and brand terms are noticeable different for this retailer that has one eye on the general consumer market, with the exception of The North Face, a brand that all retailers seem to have piece of. General terms like waterproof jackets and down jackets are prominent, as are consumer-focused brands like Fjallraven and Jack Wolfskin. A couple of things that might surprise you are Compasses (despite 10000+ terms generating traffic for them, ‘compasses’ brings over 1% of all Cotswold organic website traffic) and Rab. 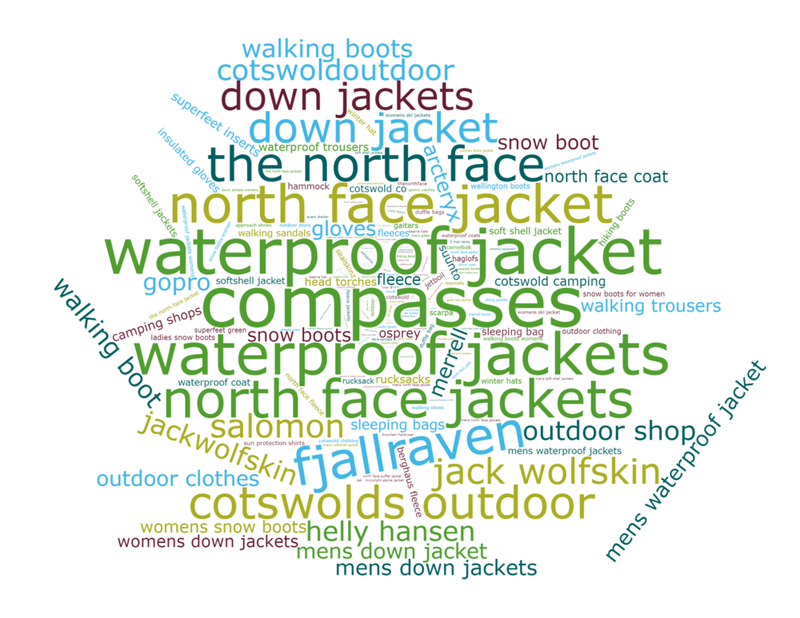 Whilst Rab is a very visible range instore and on Cotswold’s website, only 2 of their 200 top search terms feature the brand and are well down the list. This doesn’t necessarily mean that other retailers are doing a better job of convincing Google that they offer a more credible proposition. It’s actually because other brands do better on the brand term alone (Rab), including Rab itself and Go Outdoors. This leaves Cotswold as a dominant player on lower volume terms like ‘Rab microlight jackets’ (actually Rab itself, Gooutdoors and Alpinetrek). I’ve scratched the surface in this article, but tried to show how deep analytics can be combined with easy-to-understand presentation to provide meaningful information. It certainly illustrates, in this instance, how Ellis Brigham and Cotswold’s positioning filters through clearly into Google’s view of the world. However, it’s undoubtedly the case that many ecommerce teams will not be considering their competitors in this manner - trying to see their own business in the context of others. This analysis used data from Resonant’s DCrux database. 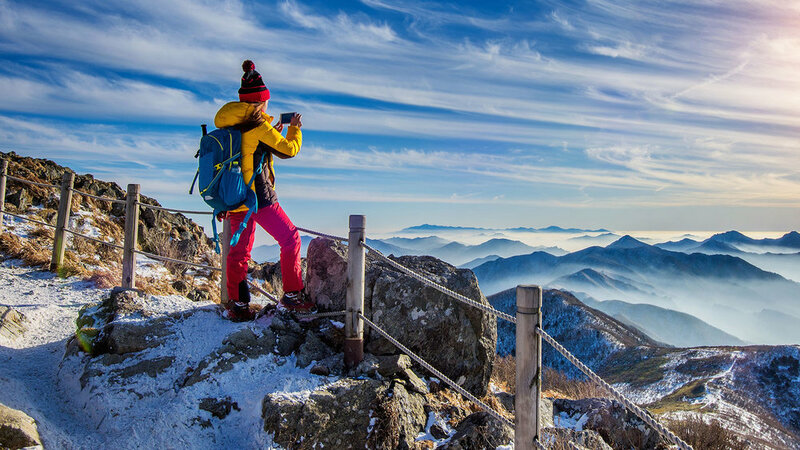 Digital Crux is a key client resource that constantly collates data on leading outdoors retailers and brands, including Go Outdoors, Cotswold, Gaynors, Mountain Equipment, Rab, Montane and many more. If you’d like to know more about how Resonant helps clients overcome the challenges of online marketing and ecommerce, please get in touch.